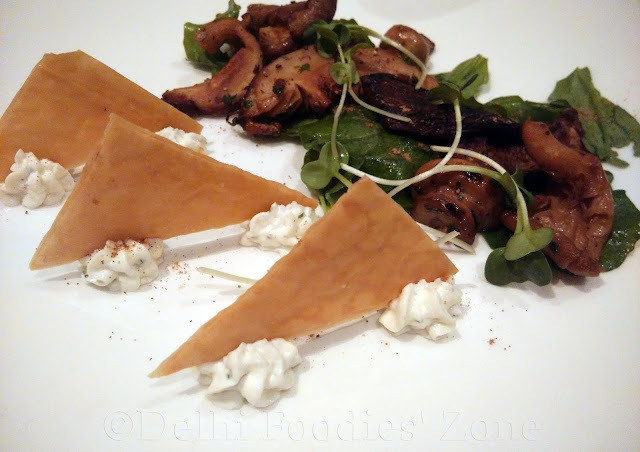 Indigo at One Golden Mile, Delhi opened with much aplomb and almost soon after, celebrity chef Rahul Akerkar exited the company. Skeeter visited the restaurant both before and after his exit and here’s an account of her last visit for a winter menu tasting. One enters the sprawling courtyard, passing by their Deli, from where Skeeter remembers picking some good breads and croissants on her last visit. 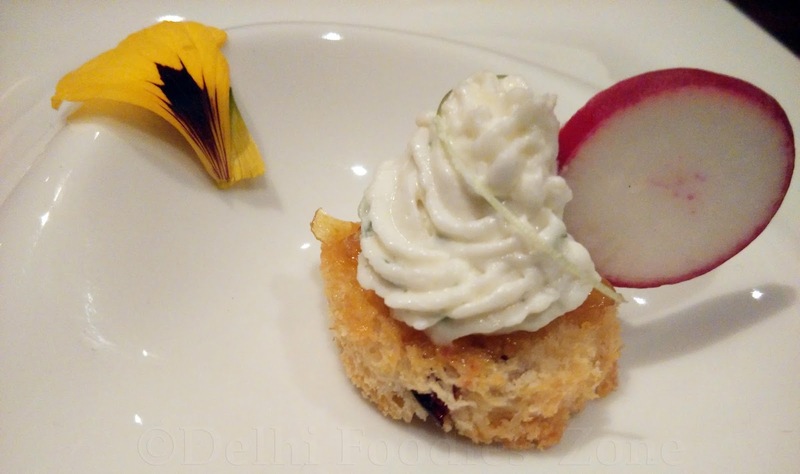 On a crisp winter evening, the tasting menu started with a lovely amuse bouche of brioche topped with jam and goat cheese, with an edible flower petal that brightened the plating. 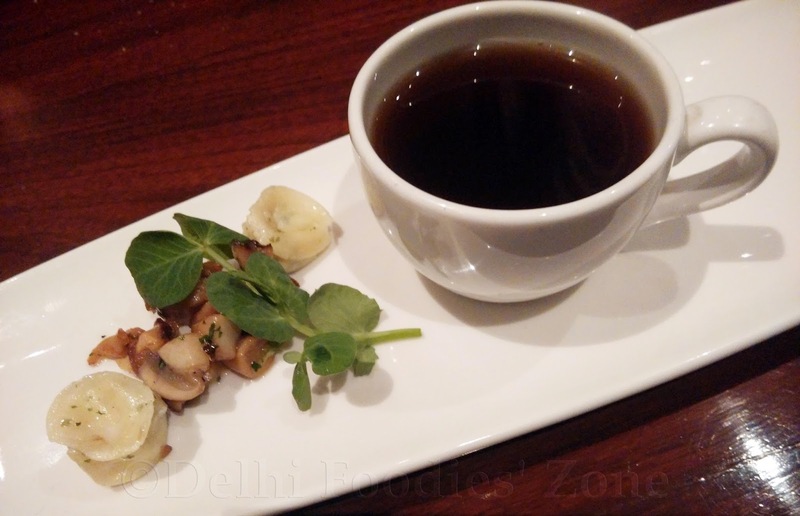 A spectacular wild mushroom consomme with mini chevre tortellini followed thereafter. The consomme was light and hearty, and the tortellini paired well with it. 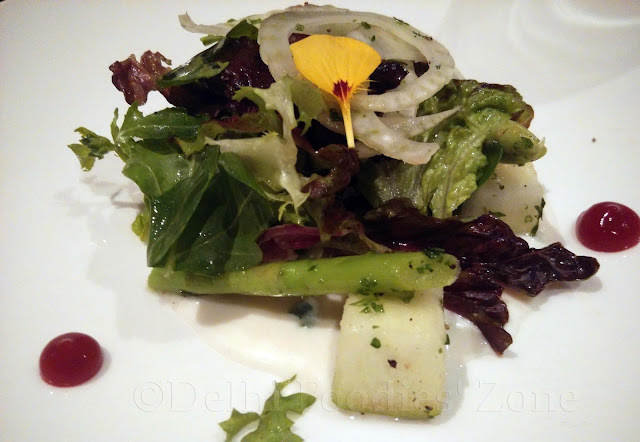 The salad of asparagus, shaved fennel & green apple, baby greens, chives and parmesan dressing was crisp, well dressed, refreshing and aptly portioned. As the evening wore, the table got a little impatient as the service got a little slow and we got our mushroom mille feuille with whipped chevre, rucola and porcini liquor, after a long wait. But the company on the table kept the evening warm with friendly banter. While the deconstructed take on the mushroom mille feuille with baked puff pastry assembled in crisp layers to stand over the whipped chevre was nice, the porcini were rather cold and the taste was amiss. Overall, a dish that is best not remembered. 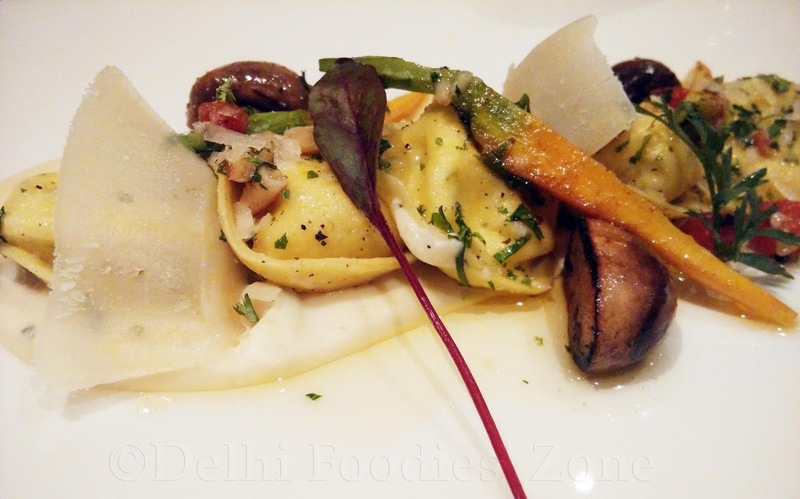 Faith in their food was restored with the Herb ricotta & saffron stuffed cappelletti (hat shaped pasta) with basil butter roasted mushrooms, baby carrots and parsnip puree. It was a stellar dish full of oomph and flavour. Skeeter would go back for this one. But the show stopper for the evening was definitely – the dessert sampler. With its fun, colourful, simple yet stunning plating, the dessert sampler consisted of a decadent and wonderfully flavoured smoked chocolate mousse, a sublime Belgian chocolate & hazelnut dome, a creamy Mango & Passion Cremeux and a Deconstructed Red Velvet Cake. 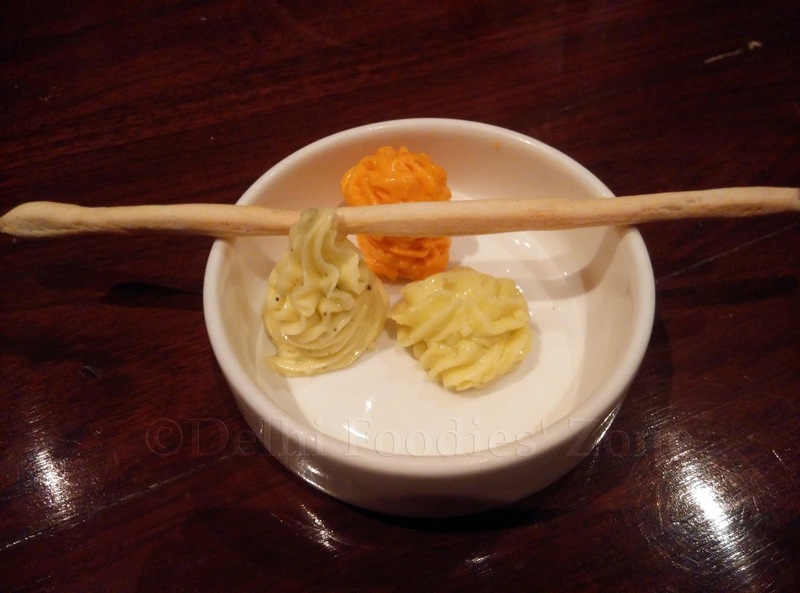 The food at Indigo is still as good after the celeb chef’s exit and the presentation has gotten better. Kudos! The gorgeous Dilli ki Sardi continues, albeit, a lot abated. What better way to make the most of it than eat out; at a restaurant with loose white pebbled floor, over lots of talking and good food! Skeety did just that at Olive Bar & Kitchen, Mehrauli, where she sampled some of the offerings of the new chef, Sujan Sarkar. He has taken over what was Chef Saby’s stronghold and is wooing diners with his food artistry. 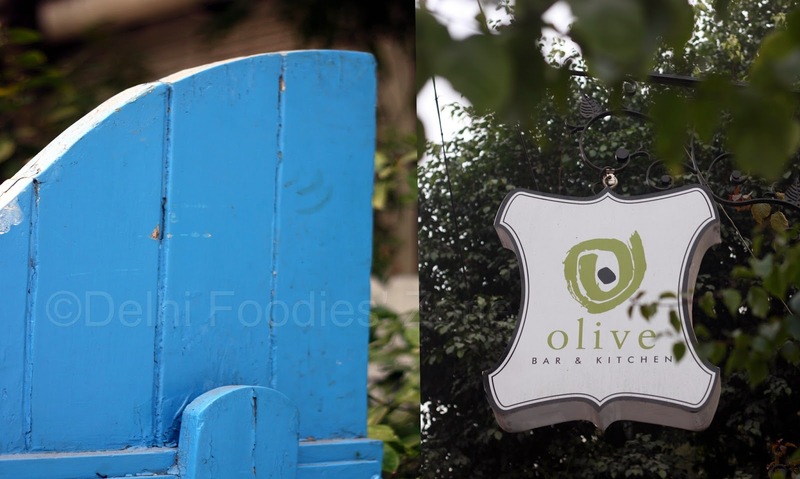 Sujan brings in a lot of zing to the food at Olive. If Skeeter has to sum up Chef Sujan Sarkar’s vegetarian food in a line it would be this: Basic vegetables cooked and served with varied elements carefully weaved together to make the dish a work of art. A wild mushroom tortellini had Skeeter floored at the onset. It has a robust flavour (hail the morels)and the presentation was at par with the taste. Nothing could comfort soul and sight more. Oh and the brioche served with it made for an excellent pairing! Next came the Deep fried Brie with marinated beetroot, mandarin, apricot pûrée and rocket leaves. The thing about cheese is that when you cook it, it needs to be served at the right temperature. You either hit the spot or miss it. The brie was perfect and the accompaniments made it better, especially the marinated beetroot. Skeets is a big beet fan anyway. Gnocchi served up right in the cast iron skillet on a wooden tray was a treat to the eyes. Just like your mom would bring it to the dining table at home! 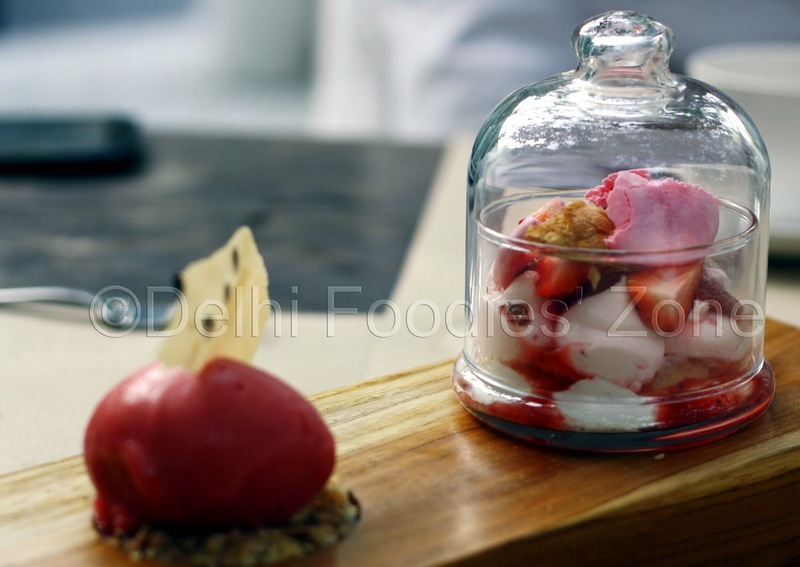 It tasted perfect and had Chef Sujan’s creative skills written all over it. The gnocchi came with broccoli and was tossed in a blue cheese sauce and sprinkled with garlic crumbs for a superb finish. Divine! The garden vegetable primavera had handmade spinach fettuccine tossed with vegetables, pesto and pine nuts. The handmade fettuccine’s texture was a revelation as the flour had semolina mixed in it to give it a crunch. Also, it would retain its texture for a greater time period as compared to total APF. The pesto in which it was tossed tasted fresh and the dish was decadent. It was served with a truffle mash potato on the side. The signature dark chocolate fondant was well plated but nothing to write home about. 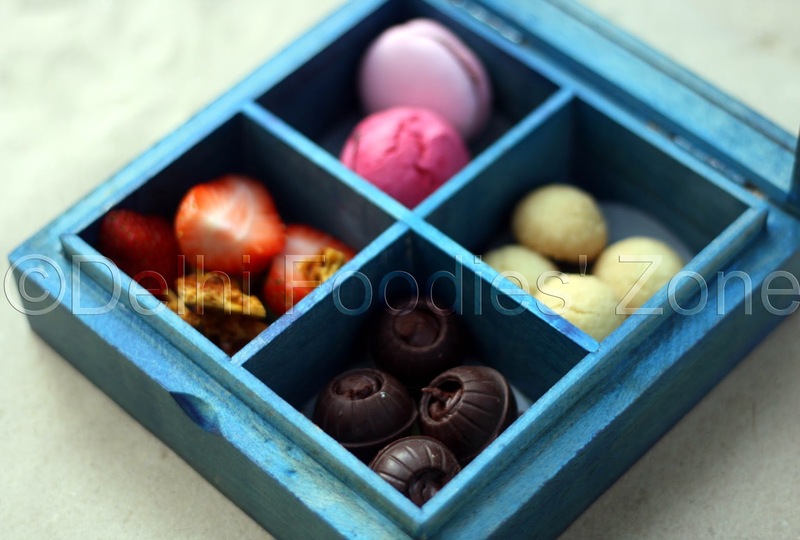 Also, do try their petit fours which come in a striking peacock blue box containing butter cookies, honeycomb, chocolate bombs with Callebaut goodness and a stack of macaroons. Go for it! P.S. You are likely to experience a visible change in the staff. They know what they are serving and would come and politely introduce themselves to you. A good sign, I say.